The area around Lake Tawakoni is rich in Native American history having been occupied by "prehistoric Indians" and used as a stop over for many of the historic Native American Tawakoni Indian tribes for which the lake is named. The name Tawakoni means "river bend among red sand hills" After the Indains the land was settled by ranchers and farmers. The damming of the Sabine River began with the construction on the earth filled Iron Bridge Dam and concrete spillway in January 1958 and was completed in October 1960. 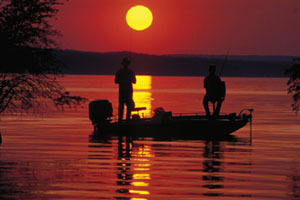 Lake Tawakoni is 37,879 acres with 200 miles of shoreline and a maximum depth of 70 feet. Texas Parks and Wildlife says the water is "modertly stained" - we would call it a little brownish with a foot of visibility. The shoreline is treed and very sparsely developed. 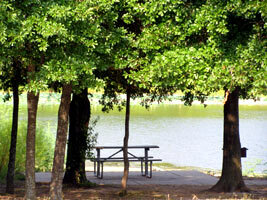 There are five public boat ramps and numerous privately-owned access facilities near the lake. 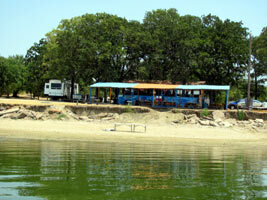 Accommodations range from motels and cabins to RV sites and tent camping, the best of which is Lake Tawakoni State Park. You'll find some convenience stores, fishing piers, marinas with gas pumps, and a couple restaurants you can boat up to. Tawakoni is best known for fishing - it's excellent for Catfish, Striped & Hybrid Striped Bass, and White Bass and good for Crappie and Largemouth Bass. Striped and hybrid bass are stocked annually by TPWD to maintain the fisheries. Channel and blue catfish are abundant, along with limited numbers of flathead catfish. Largemouth bass is also a popular sportfish in this reservoir. Crappie fishing can be good around standing timber, bridge pilings, and artificial fish attractors .Various facilities offer bait and tackle shops. The lake is also good for recreation activities and for a lake so close to Dallas and the metroplex (less than 40 miles), it seems virtually undiscovered with little boat traffic. 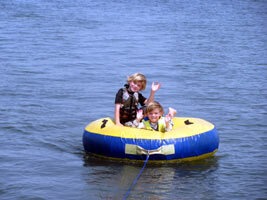 There are several good spots for boarding and tubing. Beware there are stumps in various portions of the lake where you wouldn't expect them and several shallow spots. The southern portion of the lake below the 2 mile bridge is best for boating.